A speech text for the visual age. 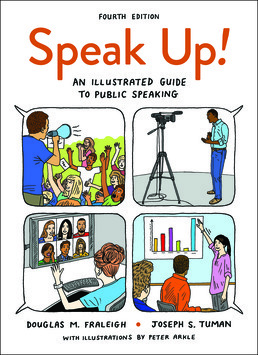 Smart, comprehensive, fun, and affordable, Speak Up will help you learn through lively writing, compelling real-life examples, practical guidance, and hundreds of hand-drawn illustrations that bring concepts to life. This edition includes Speech Choices, a new case study feature that will lead you through all steps of the public speaking process. In LaunchPad, you can access related full-length speech videos, video clips, and adaptable quizzing to better your understanding of key concepts. Which Route Will Audience Members Follow?